The living room is painted. I still need to paint all the new trim but only the trim around the windows can be cut and installed at this point. Laying the hardwood flooring is the next big thing, but that's not going to happen until the boot comes off. So . . . This week should be an easy one. Except for work; there is always the potential for surprises there. Do you plan some pool running? I hope to rake leaves this week without worsening my sore back. Also having a real estate agent come to look the place over with an eye toward selling, eventually - plan is to relocate along with daughter and her family in Summer, 2018. There will definitely be pool running. At least five, maybe six days. 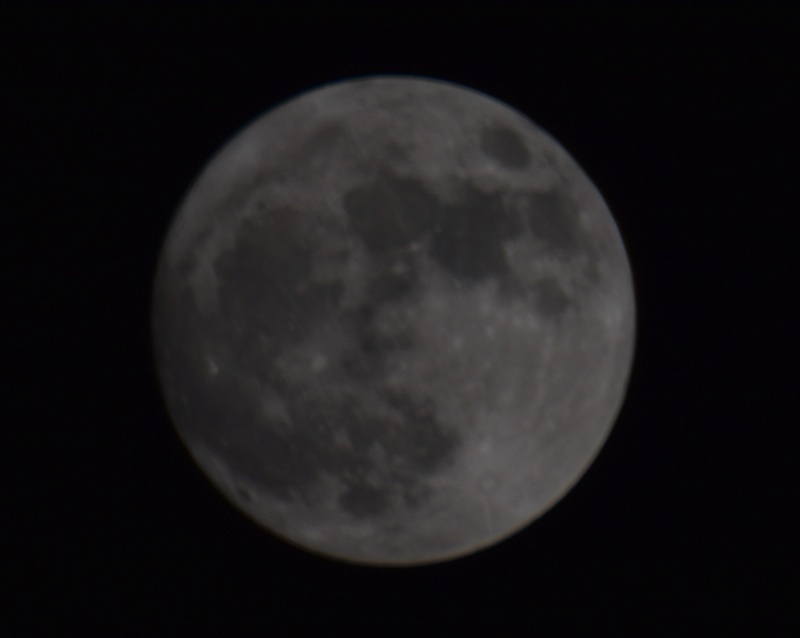 Last night's super moon. The photo is not as bright as it should because I couldn't get the remote shutter release to work, and I had to use a faster shutter speed to minimize the effect of triggering it manually. Using the camera's self-timer would have worked, but I haven't yet learned how to use it. ^ Nice PO. The first night of the SM, it was at it's brightest at 6:23 a.m, right before sunrise The second night it was cloudy so didn't see anything. Nice picture, poppy! But tell me, why are you in a boot? I will read back, but I must know..... Headed home. We are sitting in Detroit airport on the last leg of our journey home. Been a great vacation. Italy, Croatia, Montenegro, Greece, France and Spain. I wil share some pictures tomorrow. Hope all of you are well. Neat itinerary, looking forward to pics! Welcome back home! Looking forward to seeing your pictures. Just over two weeks ago while out on the morning run, on one of my well-traveled routes, I stepped on a walnut, rolled my ankle, and broke the fifth metatarsal in my left foot. I have rolled my ankle many times with no ill effects, and I thought this time was no different. Until I took a couple steps and then I knew this time Was Different. So, I'm wearing a boot for maybe another four weeks and trying to lose as little fitness as possible by doing deep water running. I know about the one walnut tree on my route and so know to watch for them on the road this time of year. But the walnut I stumbled over was a mile away from the tree. And how do I know it was a mile away and not, say, half a mile? You're not really going to ask a runner that, are you? Those pesky squirrels are moving walnuts to mess with your mind! Oh Gosh Poppy, so sorry to hear that! Funny though about the mile away from said tree. 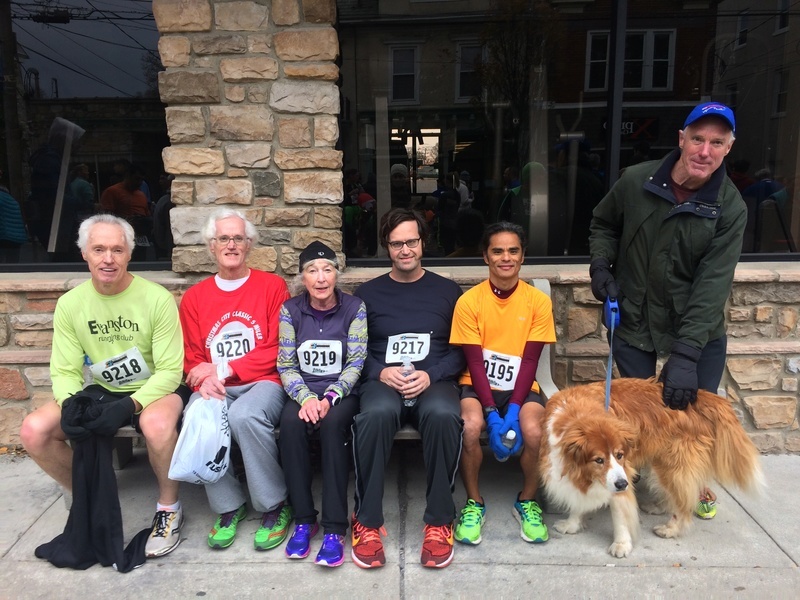 Team Nazaretti at the Pumpkin Pie 5K. Good lookin' crew you got there. That's a great picture, Nazaretti!